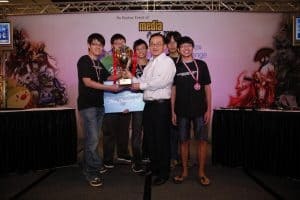 Saturday, 19 March 2011 – The first-ever Singapore Game Box Inter-Tertiary Challenge winners were announced today after more than six hours of intense gaming in the grand finals of the competition. Four teams represented their respective tertiary institutions – DigiPen Institute of Technology Singapore, Nanyang Polytechnic, Republic Polytechnic and Singapore Polytechnic – to pit their gaming skills, knowledge and dexterity against each other in the final round of competition for the Challenge title. The team from Nanyang Polytechnic emerged as champion to win the top prize of $3,000 in cash. The teams from Singapore Polytechnic and Republic Polytechnic were the first and second runners-up, winning cash awards of $2,000 and $1,000, respectively. The prize ceremony was officiated by guest-of-honour Mr Seah Kian Peng, Member of Parliament for Marine Parade Group Representation Constituency (GRC), together with Mr Thomas Lim, Senior Director, Interactive Media and Games, Media Development Authority of Singapore (MDA) and Mr Nicholas Aaron Khoo, Co-Founder & Chairman, Singapore’s Cybersports and Online Gaming Association (SCOGA). The Singapore Game Box Inter-Tertiary Challenge is one of the largest competitions for local games held at the tertiary level. Organised by SCOGA with the support of MDA, it aims to promote a spirit of competition and e-sportsmanship amongst youths, as well as help local developers gather direct feedback from gamers to further enhance their game design. This challenge also exposes more Singaporeans to Made-In-Singapore games, amongst which are several award–winning titles. The Challenge attracted more than 100 participants from various tertiary institutions in the qualifying rounds which were played following its launch in November 2010. The Singapore Game Box Inter-Tertiary Challenge was held at the nex Mall, in conjunction with Media Fiesta 2011. It is the third anchor event in this year’s Media Fiesta which is hosted by Media Development Authority to promote the discerning and responsible use of media, deepen appreciation for made-by-Singapore media content, services and applications, as well as allow Singaporeans to embrace emerging media technologies for work, learning and play. To highlight the important role that gaming can play in education, the evening’s program also included an exhibition match of OrCganic Reactrics between two teams from Anderson Junior College and River Valley High School. OrCganic Reactrics is a multiplayer, role-playing game for Junior College students to enhance their learning of Organic Chemistry. The two teams were the winners of the inter-school competition of OrCganic Reactrics held on 12 March, which saw participation from 31 teams representing 14 junior colleges and Integrated Programme (IP) schools. Supported by SCOGA, the OrCganic Reactrics gaming event also featured a cyber-wellness exhibition to help students and educators understand gaming addiction and the importance of a balanced lifestyle. As part of Media Fiesta 2011, participants at the Gaming event at nex mall were able to try out new locally developed games and discover innovative computer, video and mobile applications and services aimed at providing new avenues for work, learning and play. Following this Singapore Game Box event, the next and final anchor event for the Media Fiesta is Singapore Movies Under The Stars (26-27 March, *SCAPE), which will feature an outdoor screening of classic and recent local films. Cyber-Wellness Talks @ Campus GameFest 2013!